Hermina G.B. 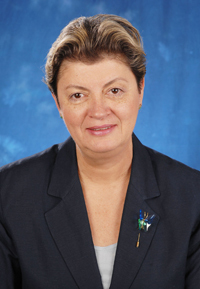 Anghelescu is a Professor in the School of Information Sciences. She holds a MLIS and a PhD from the University of Texas at Austin and a degree in foreign languages and literatures from the University of Bucharest. Prior to coming to the United States, Anghelescu worked as a librarian at the National Library of Romania. Anghelescu is a member of the editorial board of several periodical publications, including ABHB: Annual Bibliography of the History of Printed Book and Libraries, edited by the Department of Special Collections of the Koninklijke Bibliotheek, The Hague, under the auspices of the Committee on Rare and Precious Documents of the International Federation of Library Associations and Institutions (IFLA); Library Trends, published by the Johns Hopkins University Press; Libraries: Culture, History, and Society, published by Penn State University Press; Library & Archival Security and Slavic & East European Information Resources, both published by Haworth Information Press, Brighamton, NY. In addition, she serves on the advisory board of several scholarly journals published in Romania and the Republic of Moldova. She is the past Chair of IFLA's Library History Section (LHS) as well as a member of the American Library Association (ALA), Library History Round Table (LHRT) and International Relations Round Table (IRRT). Anghelescu has served as an expert and a consultant on Eastern European libraries to various national and international organizations and agencies such as the US Department of State, the Bill and Melinda Gates Foundation (BMGF), and the International and Research & Exchanges Board (IREX). She was involved with the implementation of the Global Libraries project in Romania, a $1.4 million USD pilot project in Romania sponsored by the Bill and Melinda Gates Foundation (BMGF), followed by a $26.9 million USD five-year rollover project at the national scale. The Presidency of Romania awarded her with the Cultural Merit Order for the rank of Knight for her outstanding contributions to the advancement of the Romanian civilization, culture and history abroad. In addition, she was instrumental in securing a 12 million USD grant from BMGF to modernize the public library system in the Republic of Moldova. The Moldovan Government awarded her with one of the highest distinctions in the country. Hermina Anghelescu spent time overseas as a Visiting Professor. In Fall 2016 she taught at the University College London-Doha, Qatar, School Library & Information Studies and in Fall 2017 she taught at the University of Tsukuba, School of Library, Information and Media Studies, Tsukuba-shi, Japan. Hermina Anghelescu's publications include editing a special-themed double issue of Library Trends on Libraries in a Postcommunist World: A Quarter of a Century of Development in Central and Eastern Europe and Russia (part I: 63/ 2/Fall 2014 and part II: 63/4/Spring 2015) and co-editing a special issue of Library Trends (58/4/Spring 2010) on Changing Visions: Parliamentary Libraries Past, Present, and Future (Johns Hopkins University Press). She is co-editor of two volumes published by the Library of Congress, Center for the Book: Books, Libraries, Reading & Publishing in the Cold War (2001) and Libraries & Culture: Historical Essays Honoring the Legacy of Donald G. Davis, Jr. (2006). Other works include the co-translation from French into English of Suzanne's Briet classical text Qu'est-que la documentation?/What Is Documentation? (2006) and the translation into Romanian and editing of several volumes of conference proceedings. She has also compiled cumulative indexes including the Libraries & Culture: 25-Year Cumulative Index, 1966-1990 (1995) and bibliographies such as Citizenship in the Humanities and Social Sciences: A Selective Bibliography, 2000-2009. In addition, she has published research articles, chapters, and dictionary and encyclopedia articles, as well as back-of-the-book and journal indexes, and some 60 book reviews. Honorary member of the Association of Public Librarians and Libraries in Romania for continuous support of the public library system in Romania. First Rank Distinction, one of the highest awards in the Republic of Moldova, for longstanding activity in librarianship and continuing and sustained support of Moldovan libraries. Information Organization and Retrieval; Information Seeking Behavior; Indexing and Abstracting; Public Libraries; Comparative and International Librarianship; Library history with focus on Central and Eastern Europe, with concentration on the Cold War era and the post-communist period.